When you read stories about Japan, everyone raves about how amazing the country is with its one downfall being the cost. It is true - Japan is an expensive country for travelers. But, is it any more expensive than a major U.S. city? As a general rule, we have been trying to travel for less than $125 a day. This number allows us to travel for at least a year and do so relatively comfortably. It includes everything while traveling except for the costs of visas and long haul travel like flights and long train trips for which we have a separate budget. Up until Japan, we were doing really well, often averaging $75 a day, mostly because we spent three months living in low-cost Cambodia. After traveling for 17 days in Japan, we came in at $137 per day. Yikes. But, it's what we expected to spend given some of the choices we made during our time in the country. At only $12 over a day on average against our budget we didn't do too bad. We spent $2,337 for 17 days in Japan at an average per day cost of $137. We also spent $610 on long distance travel (trains and buses throughout the country). In Tokyo, we rented an apartment in an area a little outside of the downtown area for $90 a night. On the Pacific Ocean in a little town of Ohara, we rented a yurt with an incredible ocean view for $90 a night. After years of renting apartments and houses in California during our weekend travels, we rarely got deals that good in such great locations. A quick search in San Francisco on Airbnb (what we used to rent our Tokyo apartment), listed only 6 results for a private apartment in a San Francisco neighborhood for under $100. 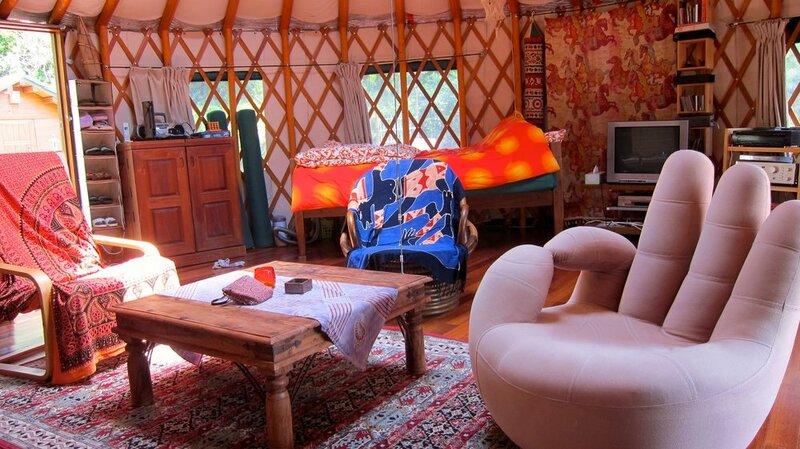 The yurt - our favorite accommodation in Japan. Our cheapest accommodations came from Airbnb again, but it was sharing an apartment with a young man who had an extra bedroom he rents out. For less than $50 a night in Kyoto (a main spot on the tourist trail), we had our own bedroom, access to a kitchen and washing machine and a central spot for seeing the sights. Hostels are a decent bargain in Japan compared with hotels. We chose to have a private room and spent around $60 a night, however, Japan hostels are more expensive than hostels in other countries. For comparison, we had a private room with an ensuite bathroom in Shanghai for $35 a night. Our biggest splurge was staying in a mountain lodge in the Japanese Alps for close to $200 a night. It was a traditional Japanese style inn and was a great Japanese experience complete with six course meals, public bath (called an onsen) and a staff that went out of their way for us. These prices are no different than what a hotel room would cost in Yosemite or in Lake Tahoe, but our breakfast and dinner was included. These two days are what really damaged the daily budget. Our room at the mountain lodge. The apartments and the yurt we stayed in all allowed us to cook our own meals when we wanted, which is hard to come by in some areas in Japan. We found groceries to be really reasonable and walked out of a store with meals for three full days for under $70. This included meat to grill, sushi, fresh fruit and alcohol. At our hostel in Takayama, we joined a Takoyaki party that included more food than we could possibly eat for $3 each. In our inn in the Alps, our huge breakfasts and dinners were included in the room price. We tried to be as budget conscious as we could on food and drinks since we know that is where we tend to spend most of our money. We shared meals when we weren't that hungry and bought picnic snacks often to have on train trips or during long hiking/walking days. A healthy share of ramen was also consumed. Roasted pork ramen - yum! Japan's railway system is both a blessing and a curse. It can quickly transport you anywhere in the country in just a few hours, but it can also cost a lot of money if you take a lot of long distance, high speed trips. We only took the Shinkasen (bullet train) once and saved more than 100% on one long distance leg by taking a highway bus rather than the train. Bus and train travel in Japan is comfortable, clean and efficient. A typical long-distance train car. All in all, we found Japan to be just like traveling in major metropolitan areas in the U.S. It has modern conveniences, tremendous options for food, a variety of accommodation choices and great ways to get around. You pay for these things, that's just the way it goes. I would never deter someone from going to Japan because of the costs. If you can afford to spend a week in San Francisco, New York or Chicago, you can afford to spend time in Japan (other than the cost of getting there of course). I'd love to come back when actually have an income so I can do some of the things we chose not to because of cost. We have spent $10,950 in 123 days of travel for an average cost per day of $89. This does not include inter-country travel and visa costs below, which are outside of the daily cost. Side note - we didn't detail out our Shanghai trip in late April because it was so short, but we came in under budget there, spending an average of $108 per day. We are heading down under to spend two and a half months between New Zealand and Australia, which are also expensive countries. We will be driving a camper van through most of it to try and keep our costs down, but stay tuned for another budget-breaking post once we get through them!